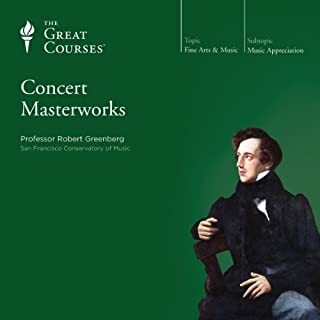 Would you consider the audio edition of Concert Masterworks to be better than the print version? Absolutely yes...it is essential to "...get it in our ears," says Professor Greenberg, as he teaches the thematic development in various forms of composition, he walks us through each work playing key parts, as if sitting at our side discovering the original intentions of each great master he reviews. 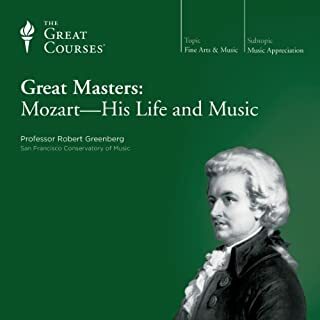 Audio lends itself very well to great learning enjoyment...I augment the lessons by listening further online to entire works Dr. Greenberg introduces. What was one of the most memorable moments of Concert Masterworks? The section on Paganini and Franz Liszt...the influence of mastering technique to the extreme capability of an instrument and the inspiration of virtuoso on generations centuries forward was fascinating...one could then see how musical composition became transformed to accommodate the extremes in performance. Yes...Mozart: His Life and Music...in contrast, Concert Masterworks was much broader in scope covering select works of many great composers spanning from and including Bach, Haydn, and Mozart's era through the 19th century, Beethoven, Chopin, Paganini, Brahms, Liszt, Dvorak, and into the early 20th century, Strauss, Tchaikovsky, Rachmaninoff. Dr. Greenberg does give attention to biographical details as well as social cultural changes as they influenced changes in compositional and thematic forms in music. Would you listen to Great Masters: Mozart - His Life and Music again? Why? Yes...it is a fascinating biography...although I loved the film AMADEUS, this tells the truth versus the fiction and clarifies where Mozart fits into an evolving art form in the context of world history. The development of the genius of Mozart in the context of the times in which he lived. His zest for srorytelling and light humor.